A useful resource, worth keeping an eye on, is the mapping service provided by UNOSAT – the UN Institute for Training and Research (UNITAR) Operational Satellite Applications Programme. While the majority of content is development-related, occasional products focus on sub-state conflict. 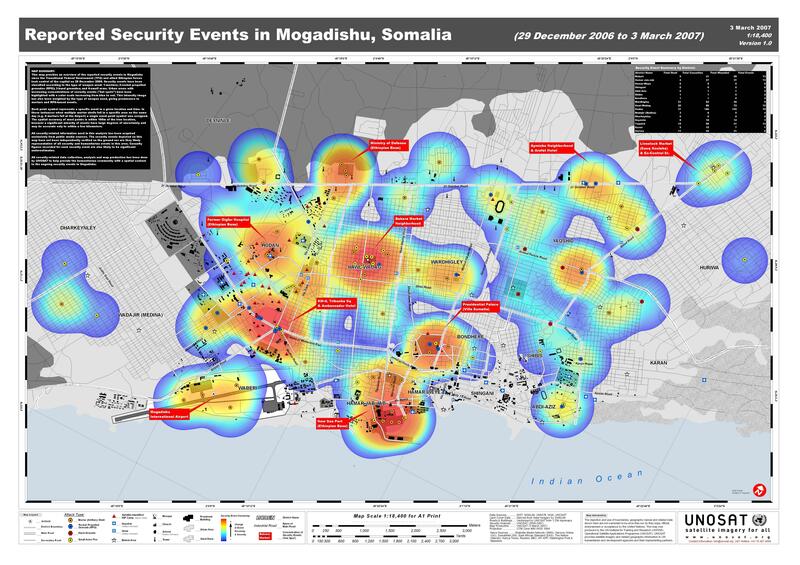 Two recent products include a map of insurgent incidents in the Somali capital Mogadishu since the Transitional Federal Government (TFG) and allied Ethiopian forces took control of the city on 29 December 2006; and a map of reported incidents of piracy off the Somali coast from 1 January to 24 April 2008. The two maps are interesting both for the information they present, and the way in which they represent it. An original PDF copy of the map of insurgent incidents in Mogadishu is available here, and the map of piracy incidents is available here. UNOSAT is the UN Institute for Training and Research (UNITAR) Operational Satellite Applications Programme, implemented in co-operation with the UN Office for Project Services (UNOPS) and the European Organisation of High Energy Physics (CERN). The UNOSAT core team consists of UN fieldworkers as well as satellite imagery experts, geographers, geologists, development experts, database programmers and internet communication specialists. This unique combination gives us the ability to understand the needs of our users and to provide them with suitable, tailored solutions anywhere at any time. UNOSAT created an extended network of public and private partners, and collaborates with the majority of UN agencies, space agencies and several international initiatives active in satellite technologies field. Created initially to exploit fully the potential of satellite earth observation, UNOSAT has developed skills in additional technical areas such as satellite navigation and telecommunications and is today looking into the future of integrated solutions. Our mission is to deliver integrated satellite-based solutions for human security, peace and socio-economic development, in keeping with the mandate given to UNITAR by the UN General Assembly since 1963. Our goal is to make satellite solutions and geographic information easily accessible to the UN family and to experts worldwide who work at reducing the impact of crises and disasters and plan sustainable development. The IRG is a multi-disciplinary group focused on the study of insurgency and the development of counter-insurgency policy. For more information, see the About the IRG page. Click Here to subscribe to posts via RSS, or Here to subscribe to them via email. Click Here to subscribe to reader comments via RSS, or Here to subscribe to them via email. For help subscribing, and for information about using RSS feeds, click here.